ANTI-HAIR LOSS SERUMANTI-HAIR LOSS SHAMPOO 250 ml. GH3D-391 | Size: 200 ml / 6.8 fl. oz. Hair loss (or alopecia) is a very common condition and affects most people at some time in their lives. It can affect both women and men and became a very serious concern when the amount of hair lost exceeds the normal limits. Alopecia can be caused by many factors such as: predetermined genetic factors, overall aging process, nutritional imbalances, immune disorders or hormonal disorders, pregnancy, stress, inadequate treatments applied to hair. The Gerovital Derma+ Anti-Hair Loss Shampoo is design to stop the excessive hair loss and to stimulate healthy hair growth. It is formulated with Procapil® - a new, natural, revolutionary biological active complex consisting of a combination of vitaminated biotinyl tripeptide-1 with apigenin and oleanolic acid. It targets the primary causes of alopecia and has anti-inflammatory proprieties. Bio-Capigen is a complete biological, botanical and biotechnological complex designated to reduce the hair loss and stimulate the hair growth. Maca Root Extract stimulates hair growth and prevents hair loss, offering protection against endogenous and exogenous stress. Maca is a recently discovered “super-food” containing vitamins, amino acids, phytonutrients, minerals, and phytohormones which can bring back lost hair. Apply shampoo to wet hair, gently massaging. Rinse and repeat application. After 2-3 minutes of acting rinse thoroughly. Use 2-3 times in the first week and then 2 times per week for 3 or 4 months. Treatment may be resumed after a break of 2 months. During the 2 months break you can use the Gerovital Derma+ Shampoo for Sensitive Scalp. Apply shampoo to wet hair, gently massaging. Rinse and repeat application. After 2-3 minutes of acting rinse thoroughly. Use 2-3 times in the first week and then 2 times per week for 3 or 4 months. Treatment may be resumed after a break of 2 months. 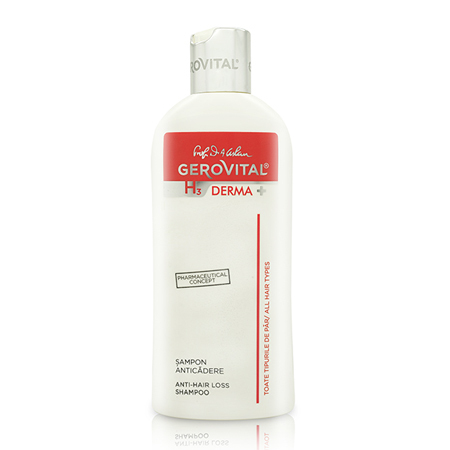 During the 2 months break you can use the Gerovital Derma+ Shampoo for Sensitive Scalp. INGREDIENTS: AQUA, SODIUM COCOAMPHOACETATE, UNDECYLENAMIDOPROPYL BETAINE, SODIUM LAURETH SULFATE, PEG-200 HYDROGENATED GLYCERYL PALMATE, PEG-7 GLYCERYL COCOATE, PLACENTAL PROTEIN, HYDROLYZED SOY PROTEIN, PROPYLENE GLYCOL, PANTHENOL, ZINC PCA, GLUCOSE, ORNITHINE, NIACINAMIDE, ARGININE, PYRIDOXINE, GLUCOSAMINE HCL, CITRULLINE, BIOTIN, CHLORPHENESIN, PHENOXYETHANOL, SORBIC ACID, BUTYLENE GLYCOL, PPG-26-BUTETH-26, PEG-40 HYDROGENATED CASTOR OIL, APIGENIN, OLEANOLIC ACID, BIOTINOYL TRIPEPTIDE-1, GLYCERIN, LEPIDIUM MEYENII ROOT EXTRACT, CITIRC ACID, POLYQUATERNIUM-44, PHENOXYETHANOL, ETHYLHEXYLGLYCERIN, PARFUM, METHYLISOTHIAZOLINONE, SODIUM CHLORIDE.